Here is a list of the awards made to papers, posters and demonstration and semantic web challenge entries for the Seventh International Semantic Web Conference. Cash prizes totalling 4850 € were generously provided by Elsevier, publisher of the Journal of Web Semantics, and the Semantic Web Science Association (SWSA), the sponsor of the ISWC series of conferences. ISWC 2008 research track included 43 papers selected from the 261 submissions. A panel of judges selected a short list of three papers and attended the presentation of each one. This year the Semantic Web Challenge had two tracks with different criteria: the Open Track and the Billion Triples Track. After an initial review, thirteen submissions were accepted and evaluated for the Open track and nine for the Billion triples track. A panel of eleven experts judged the submissions in two rounds. In the first, five finalists were selected based on their submitted descriptions and a poster and demonstration on Tuesday evening. The panel then ranked the finalists based on a presentation the next day. Elsevier provided three generous cash prizes for each track: 1000 € for first place, 500 € for second and 250 € for third place. Sebastian Boehm, Johan Koolwaaij, Marko Luther, Bertrand Souville, Matthias Wagner, Martin Wibbels (DOCOMO Communications Laboratories Europe) for their poster IYOUIT – Share, Life, Blog, Play. Bella Manoim, Robert W. McGrail (ASC Laboratory) for the poster Toward an Ontology for Finite Algebras. Deborah McGuinness, Peter Fox, AK Sinha, Robert Raskin, Abdelmounaam Rezgui and Patrick West (Rensselaer Polytechnic Institute)for Semantic Data Integration and Registration: Application to heterogeneous atmosphere and volcanic data sources. The Grand Prize is an iPod Nano! in the SMW User Forum. Join the STI Community and stay up to date on the activities of the semantic web community! Know who knows what in the Semantic Web and be among the first to experience the innoraise social Semantic application platform at work. Innoraise combines search and social networks to keep you up-to-date on your peers of interest and allows you to discover new interesting peers based on their contributions in the Web and in published work. The Seventh International Semantic Web Conference (ISWC 2008) will have a special ad hoc session of “Lightning Talks” at 14:00 on Thursday. This will provide an opportunity for conference participants to present ideas, comments, calls for collaboration, scathing polemic criticisms, etc. Controversy and discussion are positively encouraged! We particularly welcome observations or comments arising from material presented during the conference. Talks must last less than two minutes and can include just one PDF slide. There is no review process -— if you are interested in presenting a lightning talk, please send email to Steffen Staab (staab[at]uni-koblenz.de) with the subject “Lightning Talk” with your name, affiliation and a one sentence description of your talk. You have until 12:00 on Thursday October 30 to register your interest. All of the ISWC2008 presentations and most of the tutorials will be recorded on video by the Center for Knowledge Transfer in Information Technology of the Jozef Stefan Institute. After editing, they will be available at VideoLectures.net, which provides free and open access to high quality video lectures by distinguished scholars and scientists from around the world. If you are a speaker and want your talk published, you must fill out a release form. This form will be available at the ISWC registration desk and from the session chairs. You can also download the form and send a signed, scanned copy to Monika Kropej. If you do not wish your talk to be filmed or published please inform Ms. Kropej. Before your talk, you will be given a small lapel microphone and asked for a copy of your slides in either Powerpoint or PDF. After editing, the videos will be synchronized with the presentation and published on the portal. Additional information is available here. So if you want to avoid long queues and are in town Saturday afternoon, feel free to drop by to pick up your registration package. Springer has released the ISWC2008 Proceedings on their site. The Semantic Web - ISWC 2008, Proceedings of the Seventh International Semantic Web Conference, A.P. Sheth, S. Staab, M. Dean, M. Paolucci, D. Maynard, T. Finin, and K. Thirunarayan (Eds. ), Karlsruhe, Germany, 26-30 October 2008, LNCS Volume 5318, Springer Berlin/Heidelberg. The volume contains 43 revised full research papers selected from a total of 261 submissions, of which an additional 3 papers were referred to the semantic Web in-use track; 11 papers out of 26 submissions to the semantic Web in-use track, and 7 papers accepted out of 39 submissions to the doctoral consortium. We would like to announce that the RDF metadata for ISWC2008 is now available on the revamped Semantic Web Dog Food site at http://data.semanticweb.org, as well as the data for most of the conference’s workshops. Every paper, author and organisation, as well as a large number of other resources can be accessed as linked data through your Web browser or a linked data browser. The data is also available through a SPARQL endpoint or as plain rdf/xml dumps. The site has been an ongoing effort for the past years, so the metadata for previous ISWCs, ESWCs, WWW2008 and many workshops are also available. We now also supports comments on papers, which will be exposed to the Semantic Web as SIOC RDF! Proceedings of the Poster and Demonstration Session of the Seventh International Semantic Web Conference (ISWC2008), Christian Bizer and Anupam Joshi (Eds. ), CEUR volume 401, Karlsruhe, Germany, October 28, 2008. The ISWC 2008 poster and demonstration page has also been updated to link to the two page papers for each poster and demo. Additional Payment Methods: While we only accept cash / Paypal by credit card / personal check as payment onsite, you can still pay for your onsite registration by bank transfer, if you register online and your money reaches us by 24.10. After that, due to the weekend, we cannot receive payments until the conference is running). Please note that we can only accept cash, Paypal and personal check as forms of payment when you register at the desk on location. If you wish to pay by credit card, this is only possible via Paypal. For that reason you might check ahead, if you have a verified Paypal Account available and linked to your credit card. Not having this might lead to problems due to Paypal limits for unverified accounts. Since verification takes some time, we strongly advise that you register and verify an account now, if you plan to pay onsite by credit card. Additional Tutorial and Workshop spaces will be awarded on a first come, first serve basis. Online “onsite” registrations will have priority. Please note that for all conferences (ISWC, OWL-ED and RR) the late registration deadline is 09.10 23:59 CEST. This will be your last chance to register and avoid the 100 Euro penalty for onsite-registration. So please register quickly, in case you did not already. Please note that 23:59 CEST equals to 2:59 p.m. PDT, for those registering from America. PDT is basically PST but during summer (Pacific Daylight Time), same goes for CEST and CET. For the late registration deadline it is really important that you do not exceed your 7 days grace period for bank transfers. If you plan to pay by bank transfer and have to run it through your administration / financial department, you should rather register now and ensure that your money reaches us before 16.10. For every payment that reaches us after 16.10, we will have to charge an extra (difference to on-site registration) onsite. For those planning to pay by Paypal: If you do not have a validated account yet, it might take some time to create an account, so please also create a Paypal account now to avoid delays. Looking forward to seeing you all in Karlsruhe! If you plan on attending ISWC 2008, please check out our ISWC social networking site and register. While you are at it, if you tag any ISWC 2008 related pictures, web posts, URLs or resources, we suggest you use the tag ISWC2008. You are invited to ISWC 2008, the major international forum for the Semantic Web. The conference serves introductory tutorials, cutting-edge research presentation, exhibitions of the latest business products, and many social activities. It also offers great social networking opportunities for meeting academic leaders, industrial practitioners, researchers, developers, and students. Please register online by October 9 to save 100 eu and take advantage of special hotel offers which are good if made four weeks in advance. 11 tutorials on, e.g., Introduction to Semantic Web, Ontology, RDFa, Multimedia, Business Intelligence, Health Care, Applications, Linked Data. 13 workshops on, e.g., e-science, reasoning, software engineering, web service, information extraction, scalability, and social network. social events , social networking, reception, banquet and dancing. The complete conference program is available at this link. Our Program Book has been finished and can been downloaded here. In it you can find the schedule, information on accepted papers and keynotes as well as other useful information. It will also be distributed in the conference bag. Update: Due to very limited interest, no guided tours will specifically be organised for ISWC. In order to make your stay in Karlsruhe an exciting experience not just in a professional sense, ISWC 2008 offers a selection of guided tours in and around Karlsruhe. 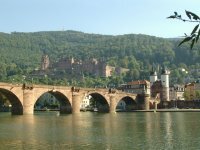 Enjoy organised trips to famous places such as Heidelberg or Strasbourg, and learn more about historic Karlsruhe. Tours will only take place if a sufficient number of participants pre-registers, and places and limited – so have a look at the ISWC guided tours programme now to make your ISWC experience even more memorable!